The Colonial Sugars Historic District is significant as one of a small number of surviving historic sugar refineries and as an example of the kind of large centralized plants developed during the consolidation of sugar refining in the United States at the turn of the 20th century. The company town is typical of the facilities created by industries for their employees in rural areas and is only one of two towns (the other is Cinclare Sugar) surviving in Louisiana. Originally known as the Gramercy Sugar Company, this sugar refinery and adjacent town was founded in 1895 by a group of New York investors. 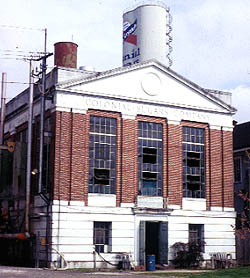 In 1902, a new firm, the Colonial Sugars Company, was organized to take over the facility. 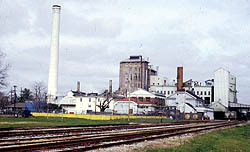 Colonial Sugars operated the refinery until 1908 when it was acquired by the Cuban American Sugar Company which ran it until 1971. Several companies have owned the refinery since that time, and today it operates at full capacity by Savannah Foods and Industries. The period 1880 to 1920 saw rampant industrial growth in Louisiana, most of which was fueled by out-of-state capital. It was during these years that mainline railroad trackage grew from under 700 miles to over 5,000 miles. Various industries matured during this period, including large-scale centralized sugar processing, industrial lumbering and oil exploration. Because most of the industrial enterprises associated with this growth were established in rural areas, the company town was a crucial feature of the emerging landscape. It was customary for the company to provide for all aspects of the workers' lives, including housing, churches, recreational facilities, etc. Points of interest in the Colonial Sugars Historic District include: Executive Row with the plant manager's house that served as the home (1928 to 1956) of George P. Meade, a co-author of the Cane Sugar Handbook and a well-known figure in the cane sugar refining industry; Workers' Row along Fifth Avenue with its cottages dating from the 1910s; the c.1910 company chapel; the 1902 Char House where liquid sugar flows through massive filters filled with bone char to remove the brown color; and the 1929 Power House, designed by the firm McKim, Meade and White, that generates electric power for the water plant and some workers' residences. The Colonial Sugars Historic District is located in Gramercy, primarily between Main St. and Levee Rd. The mill and the residences are private and not open to the public.